SEYMOUR, Ind. 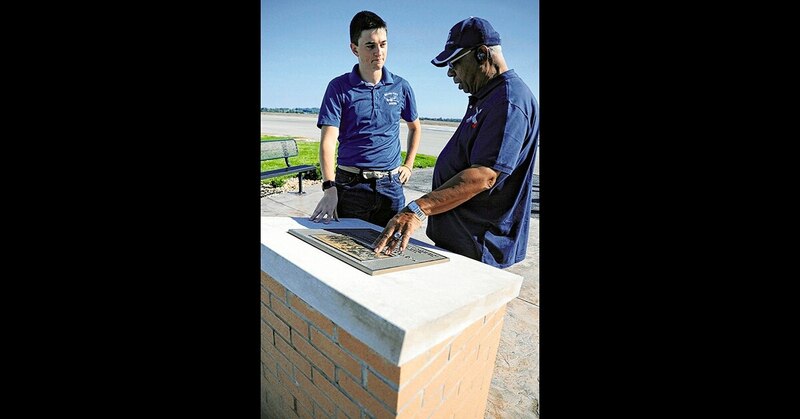 — Creating the Tuskegee Airmen Memorial Plaza as his Eagle Scout project three years ago, Tim Molinari wanted to ensure there was a record of what happened at Freeman Army Airfield in Seymour. The airmen’s actions in April 1945 changed the course of the nation’s history and led to the desegregation of the military. Molinari also wanted Freeman Army Airfield to be a historical focal point and place for inspiration that inspires future generations. On a recent Saturday, he had a chance to truly understand the impact of the Tuskegee Airmen when he interacted with 21 members of the Indianapolis and Chicago chapters of Tuskegee Airmen Inc. They weren't able to attend the memorial plaza dedication in September 2015, so Molinari made it a point to come home from Indiana State University to meet them. "It was just an absolutely incredible experience," he said. "For me, it went to show how much of an impact this project has made because back in 2015, to me, it was an Eagle Scout project, and I knew how significant it would be for the Tuskegee Airmen, but I don't think I truly understood the lifelong impact it would have. Just seeing everybody out there was a testament to that." Molinari, a 2016 Seymour High School graduate who is studying aviation management at ISU, said talking to some of the Tuskegee Airmen's family members was humbling. "They are historical figures, and they played such a major role in our nation's history, especially with the civil rights movement and the desegregation of the U.S. military," he said. "I felt honored to be among them." Col. Charles McGee — an original Tuskegee Airman, veteran of three wars, and aviation legend — still clearly remembers the day he shot down a German Luftwaffe fighter. Arann Banks, executive director of the Jackson County Visitor Center, said James Warren with the Chicago chapter reached out to her in August about the groups coming to Seymour. She then worked with the Freeman Field Flying Association to organize a day of activities for them, including lunch at Chateau de Pique Winery and a visit to Freeman Municipal Airport to see the memorial plaza and Freeman Army Airfield Museum. She said hearing stories from the group allowed her to understand the magnitude of what the Tuskegee Airmen did. "It was a huge honor, and they were gracious and fun, and they seemed to really enjoy Seymour," Banks said. "They kept making comments over and over that they really wanted to come here and be in this space. This is where it happened. This is where they want to be. I thought it was an honor, and I'm glad I got the opportunity." Karen James, president of the Freeman Field Flying Association, was the tour guide for the groups and had assistance from other members of the association and museum board. "It was really such an honor just to meet all of them and hear their stories," she said. "Obviously, the military is very important to me, so to hear their perspective and the way it impacted their life, it was just really special." Sisters Kathy Chappell and Camille Chappell Johnson were among the members of the Chicago chapter visiting Seymour. Their father, Roy Chappell, was a navigator/bombardier at Freeman Field in the 1940s. Seeing the museum and memorial for the first time gave them a chance to reflect on the actions of their father and the other Tuskegee Airmen. Robert Selway, a white officer, was the commander of the 477th Bombardment Group for a year and a half and was not popular with black officers since he attempted to enforce segregation on the bases where the group was stationed. At Freeman Army Airfield, he set up an officers club for whites and one for blacks. Selway and the base commander ordered all black officers to sign a new base regulation to acknowledge separate facilities. During the Freeman Field Mutiny in 1945, 120 of the more than 400 black officers in the 477th Bombardment Group were arrested because they refused to sign the document and staged a nonviolent protest to stand up for equal rights. They were flown to Godman Army Airfield in Kentucky, where they were confined in a building with barbed-wire fencing around it and armed guards outside. Three men accused of using force were court-martialed, and 104 received letters of reprimand. Following a trial, two of the court-martialed men were acquitted, and all of the white officers from the 477th were re-assigned to other units and replaced with black officers. Coverage of the events in the black newspapers brought attention to the situation in Seymour. Master Sgt. Harold Beaulieu, a noncommissioned officer in charge of the photo lab, had rigged a hidden camera in a shoebox to take pictures and circulate them to the black media. It has been said the Freeman Field Mutiny was instrumental in President Harry Truman issuing Executive Order 991, which directed the desegregation of the U.S. military, in July 1948. In 1995, the letters of reprimand were removed from the records of those who received them, and the man who was court-martialed and charged with assault saw his conviction overturned. Once the military was desegregated, opportunities abounded for African-Americans. "What makes it really phenomenal is that by refusing to sign, there was a time it was considered treason, so they could have been killed," Kathy said. "But they stood for what they believed in, and what we say in the chapter is these were people who were fighting for civil rights before Rosa Parks and Martin Luther King. This was like 20 years before that." Roy later served with the Chicago "DODO" Chapter of the Tuskegee Airmen and was president for many years until he died in 2002. Tuskegee Airmen Inc. was formed to preserve the history of America's first black military airmen and have them serve as role models to today's youth and expose them to a variety of career opportunities. The Chicago chapter has monthly meetings and special quarterly meetings, awards scholarships and conducts flying events for youth. "The overarching goal is to promote aviation for the youth, to encourage youth to not just be pilots, but in the whole field of aviation, there are a lot of different avenues that you can take," Kathy said. Camille is retired from teaching at Air Force Academy High School in Chicago, and Kathy is a professor at DePauw University. Both of them promote aviation and work to keep the Tuskegee Airmen history alive. Visiting Seymour was another way for the sisters to learn more so they can continue to promote the Tuskegee Airmen. "I think this is humbling to see but encouraging at the same time," Kathy said of the museum and memorial plaza. "As most people know, this part of history isn't something that was typically taught in school, so just being here, we're being enlightened." Mike Jordan, a member of the museum board, said several school and community groups have visited the museum, so awareness is growing. He was happy to interact with the two groups during their visit. "To take four hours from Chicago to come down and see part of their heritage, it's a tremendous commitment on their part," Jordan said. "It speaks volumes of what the city has done to keep the story alive." James also encourages people to visit the museum and plaza. "I think a lot of people in Jackson County really have no idea the history that we have just here at the air base," she said. "I know in other parts of the county, there are other different ways that history has really developed the country, but to know how this truly impacted the whole military, a lot of people just don't realize that. "To get them out here and to realize that and if they would have had a chance to meet these people or read some of the books, I think they would recognize how important that was."